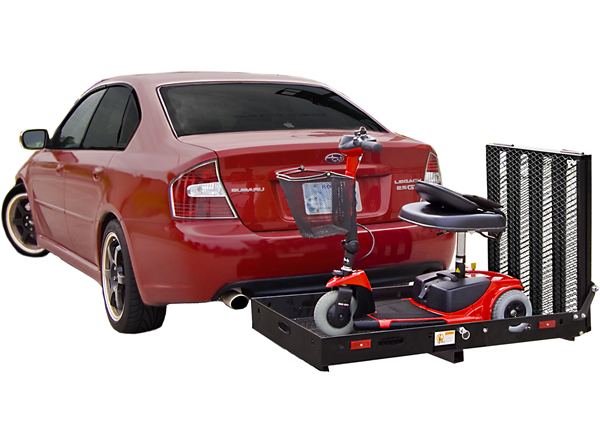 Manual racks are one of the simplest ways for transporting your mobility device for quick and easy loading and unloading. A platform manually drops down, so you can load your chair or scooter on. The person pushes their device up and onto the rack, where it is tied down. Most racks come with tie downs or safety belt straps to ensure that there is no movement or wobbling while driving on the road. The rack may block access to the back of a truck or back door, but this is to be expected. When using an outside rack for you mobility device, investing in a protective cover is a smart choice to protect from debris and weather. Please call 1 (800) 257-1776 if you need any assistance or have any questions regarding racks for your mobility device(s).